Nature, the organic and the biological exhibit growth, decay and disorder, or at least an order that is outside of human mastery. Technology equates to function, control, precision, efficiency and factory production. It’s easy to place modernity at odds with nature, and on the side of technology. But as any student of architecture knows, there was a thread of natural organicism in modern architecture, notably in Louis Sullivan’s ornamental treatment of building facades, the various forms of Art Nouveau architecture, Frank Lloyd Wright’s organic domestic floor plans that grew out from the hearth, the suggestive biophilic forms of Bruno Taut’s fantastical expressionist buildings, and Buckminster Fuller and Frei Otto’s high tech skeletal constructions clad in synthetic biomimetic membranes, to name but a few bioluminaries and their outputs. At least in the history of architectural Modernism, adherence to the biological features as an oddity, a sideline, and even an embarrassment. One source of this discomfort is the observation that National Socialism also had biocentric elements, according to Oliver Botar’s comprehensive account of biocentrism in the arts, in particular in the Bauhaus. Even though “the Bauhaus was an institution antithetical to National Socialist policies, there were Nazis who supported the Bauhaus” (36). Botar attributes this support in part to the German agriculture minister at the time, and even to “the vegetarian animal-rights supporter Adolf Hitler” (36). The movement was tarnished by the shortcomings of its fan base. In any case, biocentrism is associated strongly with Romanticism, which in turn contains elements antithetical to many of the tenets of Modernism, again, not least the political ideologies that Romanticism reputedly fostered. But it seems that the seeds of Modernism are permeated, impregnated, throughout with the biological, or at least, biocentrism. Botar asserts as much: “the ‘bio-centric’ world view — with all its political complexities and contradictions usually swept under the rug — played an important role in the development of twentieth-century art” (17). Leaders in the highly influential modernism of the Bauhaus, Walter Gropius, Mies Van Der Rohe and László Moholy-Nagy were complicit in modernist organicism, as were Johannes Itten and Wassily Kandinsky among others. Many of the Bauhaus leaders read the writings of the Austro-Hungarian botanist Raoul Francé (1874-1943). With seductive drawings of pods, cones and single celled organisms that look like designed artefacts, Francé united the natural with the technological, via his assertion of the “functionalist” character of nature: “nature’s example is radically functionalist” (22). According to Botar’s account of Francé, “Humans had much to learn from organic technology and they stood to profit from its adaptation to their purposes, a process he termed Biotechnik” (23). One of Francé’s major works was called Plants as Inventors. Botar identifies several modernist threads that give witness to the influence of biocentrism and the biotechnical, including: the “privileging of biology as the source for the paradigmatic metaphor of science, society, and aesthetics” (20); epistemology based on a kind of psycho-biology; an emphasis on nature, life and life processes rather than culture; a move away from an anthropocentric world view; the agency and unity of all life; an emphasis on flux, change and impermanence rather than stasis; and an emphasis on the whole rather than reduction to parts. Much comes down to the idea of oneness, a view that there is one substance, an interconnected unity, a philosophy manifested in its various flavours as Monist. Moholy-Nagy said of the studio teacher: “The teacher who has come to a full realization of the organic oneness and the harmonious sense of rhythm of life should have a tongue of fire to expound his happiness” (44-45). Monism was also a philosophy with support from biologist Johann Jakob Baron von Uexküll (22) and Charles Sanders Peirce. So there are connections with modernist biocentrism and biosemiotics. See Whatever happened to architectural semiotics. Botar, Oliver. 2016. The biocentric Bauhaus. In Charissa N. Terranova, and Meredith Tromble (eds. ), The Routledge Companion to Biology in Art and Architecture: 17-51. London: Routledge. As Donald Trump is sullied by the KKK, a movement such as biocentrism was in part tarnished by the shortcomings of its fan base. 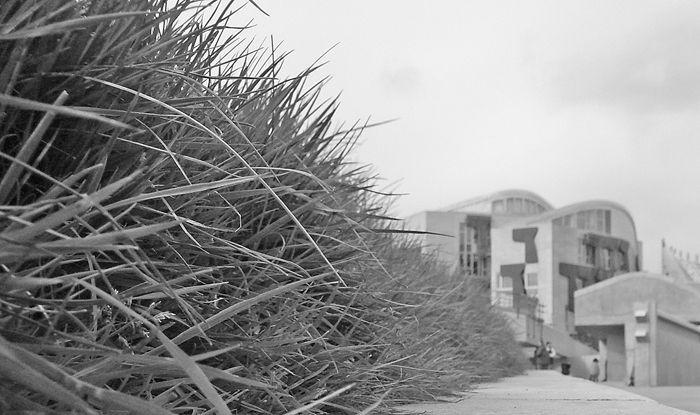 The image is of the Scottish Parliament House in Edinburgh by Enric Miralles.